New Listings in Sioux Falls decreased 15.2 percent to 347. Closed Sales were down 32.9 percent to 186. Inventory levels fell 20.0 percent to 844 units. The Median Sales Price decreased 4.0 percent to $201,500. Days on Market down 5.1 percent to 92 days. Sellers were encouraged as Months Supply of Homes for Sale was down 20.9 percent to 2.9 months. The Federal Reserve recently announced that no further interest rate hikes are planned for 2019. Given the fact that the federal funds rate has increased nine times over the past three years, this was welcome news for U.S. consumers, which carry an approximate average of $6,000 in revolving credit card debt per household. Fed actions also tend to affect mortgage rates, so the pause in rate hikes was also welcome news to the residential real estate industry. Housing supply has continued to struggle to replenish itself in most markets across the U.S., which is contributing to an overall decline in sales. Yet low inventory is not the only slowing factor in a buying environment with historically high prices. 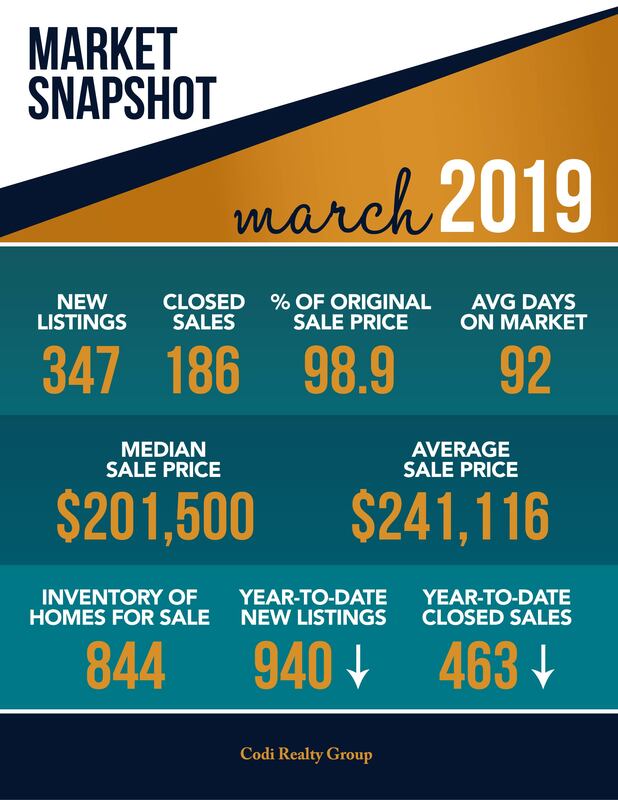 For the 12-month period spanning April 2018 through March 2019, Closed Sales in Sioux Falls were down 19.3 percent overall. The overall Median Sales Price remained the same at $205,000. Market-wide, inventory levels were down 18.1 percent. The construction type that lost the least inventory was the New Construction segment, where it decreased 17.1 percent. That amounts to 2.9 months supply for Single-Family homes and 4.2 months supply for Condos.